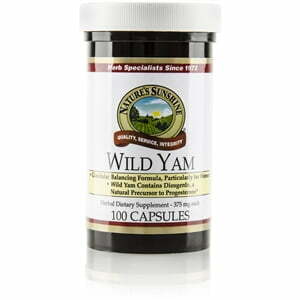 Throughout history, women have looked to wild yam to provide key nutrients as well as to balance their glandular system and alleviate menopausal symptoms. Diosgenin, a steroidal saponin and a key component of wild yam, is known for its modern use as an ingredient in commercial steroid hormones. 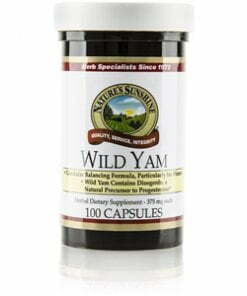 Nature’s Sunshine Wild Yam comes in 375 mg capsules and is preservative-free. Instructions: Take one or two capsules with a meal twice daily. Cellulose (plant fiber), dicalcium phosphate, magnesium stearate (vegetable), kosher gelatin and water.